Aside from close friends and family, few people know that the man responsible for revitalizing the bourbon industry actually graduated with an electrical engineering degree from the University of Kentucky. Born on a tobacco farm in Franklin County, Elmer T. Lee graduated from Frankfort High School in 1936 and began working for the Jarman Shoe Company. He joined the Air Force in 1942, where he flew on missions as a radar bombardier on a B-29 Superfortress. In 1946, he was honorably discharged and returned home to study electrical engineering at the University of Kentucky. He graduated with honors in 1949 and proceeded to take a position with George T. Stagg Distillery in Frankfort (renamed Buffalo Trace in 1999). Over the next 36 years, Lee would forge a career that would equate his name with premium bourbons. Initially a maintenance engineer, Lee was promoted to plant superintendent in 1966. In 1969, he held the dual titles of plant manager and master distiller, becoming the distillery’s first master distiller. He would continue to hold both titles until his retirement in 1985. While Lee oversaw the growth and modernization of the distillery, bourbon declined in popularity. Then, in 1984, Lee created Blanton’s Single-Barrel Bourbon. Named after distillery president Col. Albert Blanton, who hired Lee, Blanton’s became the first single-barrel bourbon to be sold commercially. One of the highest-rated bourbons available, Blanton’s marked the beginning of a renewed interest in bourbon and sparked the industry’s comeback. Lee officially retired one year after introducing Blanton’s, but his passion for bourbon kept him close to the distillery. He served as an ambassador and held the title of Master Distiller Emeritus for Buffalo Trace, educating visitors on the heritage and unique qualities of Kentucky’s bourbon whiskey. The award-winning Elmer T. Lee Kentucky Straight Bourbon Whiskey, bottled from barrels Lee continued selecting himself into his 90s, is a testimony to the stamp he impressed upon one of Kentucky’s iconic industries. Lee was fortunate to enjoy numerous accolades during his lifetime. 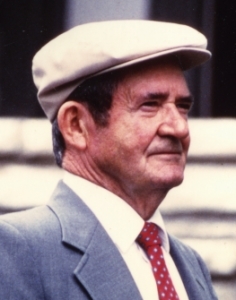 He was inducted into the Kentucky Bourbon Hall of Fame in 2001. He received the “Lifetime Achievement Award” from both Whisky Advocate in 2002 and Whisky Magazine in 2012, and Whisky Magazine inducted Lee into its Hall of Fame. Lee passed away in 2013 at the age of 93. His wife, Libby, had preceded him in death in 2006. He is survived by his daughter, Peggy Comer, a grandchild and a great-grandchild.